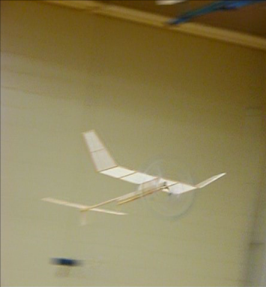 "We had our last indoor session for 2012 yesterday, and in addition to the wide range of RC types present, it was also an opportunity to test fly my new Gyminnie Cricket. This is quite possibly the first flight of a Gyminnie Cricket in Canada - and maybe even, this side of the pond! It came out at 5 grams (less rubber) and is shown flying here on a 14" loop of 1/8" tan rubber. The video shows it's 4th test flight - and remarkably, it flew right off the board - with no trim adjustments whatsoever. Could use a little downthrust maybe? Prop bearing is copper tubing soldered to piano wire. 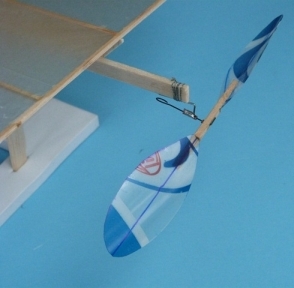 Prop is 17mm diameter with basswood hub and thin plastic blades from Tim Hortons takeaway Cappuccino cup. Condenser tissue covering."